Lisa Lillien has developed a huge following on the Internet with her Hungry Girl website and newsletter, where readers can find tips and recipes for low calorie eating. In her book, Hungry Girl: Recipes and Survival Strategies for Guilt-Free Eating in the Real World, Lillian offers recipes to satisfy cravings for your favorite foods without excess calories. Although she is not a nutritionist or chef she was able to lose 30 pounds by creating her own low calorie recipes and eliminating bread, pasta and other starchy foods from her diet. She currently maintains her weight by following the Weight Watchers point system. Lillien uses low calorie substitutes for traditional ingredients and healthier cooking methods such as baking instead of frying. This enables dieters to reduce their intake of fat and calories while enjoying modified versions of the foods they love. All of the Hungry Girl recipes are designed as single servings which makes them ideal for situations where dieters are the only member of the household on a diet, as well as for dieters who live alone. Single portion recipes also have the advantage of avoiding the temptation to go back for seconds. Most of the meals rely heavily on processed foods and ‘diet’ or ‘light’ foods that generally contain chemicals and artificial sweeteners. As such the recipes will not appeal to dieters who prefer to eat a more natural diet but are more suited to those who are looking for lower calorie versions of traditional indulgences. In addition to recipes, Hungry Girl also includes tips and tricks on how to eat at the movies, in the office and when traveling. As an example Lisa Lillian recommends sneaking in a small bag of candy to the movies instead of buying a jumbo-sized box of Sno Caps, which contains around 800 calories. Fiber one cereal, Splenda, Cool Whip Free, sugar-free chocolate syrup, sugar-free instant pudding, reduced fat cheese, fat-free sour cream, light bread, butternut squash, onion, canned tomatoes, Boca burgers, soy sausage crumbles, soy crisps, beef, turkey, liquid egg substitute, Shirataki Noodles, light vanilla soy milk. Hungry Girl: Recipes and Survival Strategies does not include exercise guidelines. 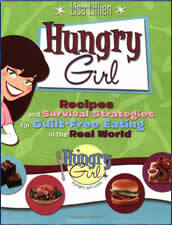 Hungry Girl: Recipes and Survival Strategies for Guilt-Free Eating in the Real World retails at $17.95. Offers dieters low calorie substitutes for their favorite foods. Hungry Girl Recipes are simple and fast to prepare. Ingredients can be found in any supermarket. All recipes include nutrition information. Most dieters lose weight when reducing calorie intake. Includes tips for eating out and while traveling. Most recipes are for lower calorie versions of junk foods. Recipes are lacking in adequate amounts of fruit and vegetables. Does not include foods rich in essential fats. Many dieters find the recipes unsatisfying. Lisa Lillien Encourages the use of processed foods and artificial sweeteners. Does not address importance of exercise and psychological factors for effective weight loss and maintenance. Lisa Lillian is not a qualified nutritionist or health care professional. Hungry Girl will most appeal to dieters who would like to continue to enjoy their favorite indulgent foods while being able to lose weight. Unfortunately there is an over-reliance on processed foods and a lack of fresh fruit and vegetables in the Hungry Girl recipes. This will impair nutritional intake while also not encouraging dieters to adjust to a healthier diet as part of a long-term approach to weight management.